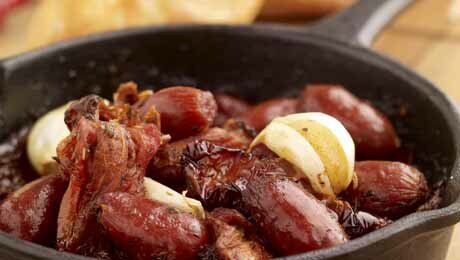 This is a very simple dish, the chorizo snacks are delicious, packed with flavour and perfect for sharing with friends. Heat a small cast iron pan with a little olive oil and then add in the whole garlic, chorizo snacks and the semi dried tomatoes and cook for 2-3 minutes on the stove top. Transfer the entire mixture to the oven and allow to cook for a further 10-12 minutes. Remove from the oven, allow to cool slightly, cover with the remaining oil and then serve with some crusty bread.